Let's Ring In Spring With The Masters Golf Tournament We've passed the vernal equinox and baseball's Opening Day was Monday, but Frank Deford argues that there's really only one true first day of spring: the arrival of the Masters golf tournament. 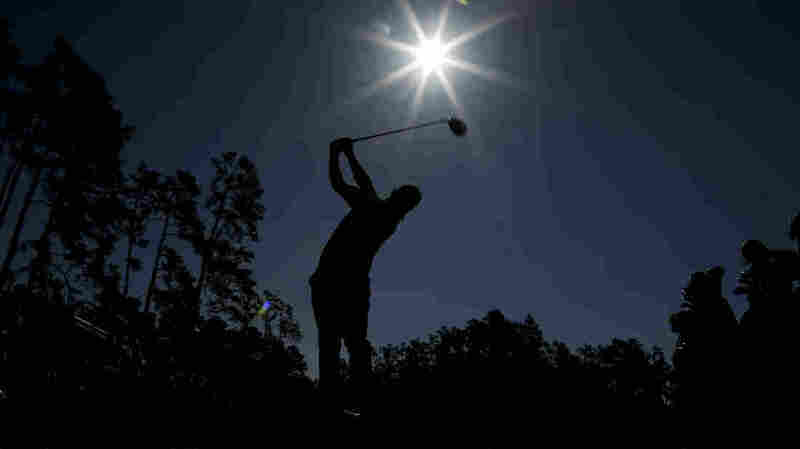 Hideki Matsuyama, of Japan, watches his tee shot on the 14th hole during a practice round for the Masters golf tournament Tuesday in Augusta, Ga. In days of yore, Opening Day of the baseball season was special, signifying that spring had come at last. Today, however, Opening Day sort of dribbles into existence, and the spiritual start of spring now belongs to the Masters golf tournament, where the azaleas and magnolias and dogwood bloom. And if they dare look like they're gonna bloom too soon, in March the groundskeepers are rumored to pack them with ice to make sure spring comes as God intended it, which this year is on Thursday. By now, in fact, the Masters course is a federal treasure, to sports what Old Faithful is to the National Park Service. And once again it is peaceful at Augusta National Golf Club, after some rather ugly stand-offs in recent years, when the club balked at changing its all-white, all-male membership tradition. African-Americans and female Americans are on the club manifest now along with other golf-Americans, and all is serene once again. Yes, some people do find the Masters too snooty and the closing ceremony is so painfully precious that even the man who for years himself produced the coronation admitted that it was "the worst thing in the world." But I'm being picayune. The Masters is otherwise a thing of efficient beauty. Start with the name. Masters sounds almost too elegant to be American. And when it comes to names? There are really only two discrete pieces of official U.S. sports real estate which are familiarly known by a title. One is a huge ugly slab, but besides that Green Monster at Fenway Park, there is only Amen Corner on the back nine at Augusta, where treachery and beauty blend together as well as any James Bond villainess. Even the fans, who must be called "patrons," are more polite and litter-conscious than at other sporting venues. The Masters is not greedy. You wanna buy a Masters souvenir logo shirt? Sure, let's go over to the nearest Ralph Lauren boutique. Oops, you can only purchase Masters memorabilia at the Masters, this one week of the year. And most meaningful of all to patrons watching at home, the tournament has fewer commercials than other sports events. Well, yes, the Masters is too stylish to be an American icon. It's as out of character for Uncle Sam as a McDonald's is for France. But hush now and stay behind the ropes. Spring begins on Thursday.